Nothing say’s Happy Father’s Day like a homemade card! Let’s put a spin on it this year and capture Daddy and son(s) foot prints. We can’t spoil the surprise, so let’s use Dads boot print! The original craft and poem was spotted on Nichole Ann’s blog. Pop over and see her beautiful print too! Print poem on white paper. Glue onto colored construction paper to create a bright border. Tip: If you only have standard sized construction paper just scale the poem size down and cut it smaller than 8 1/2 x 11. Now, time to paint! Add paint to paper plates. 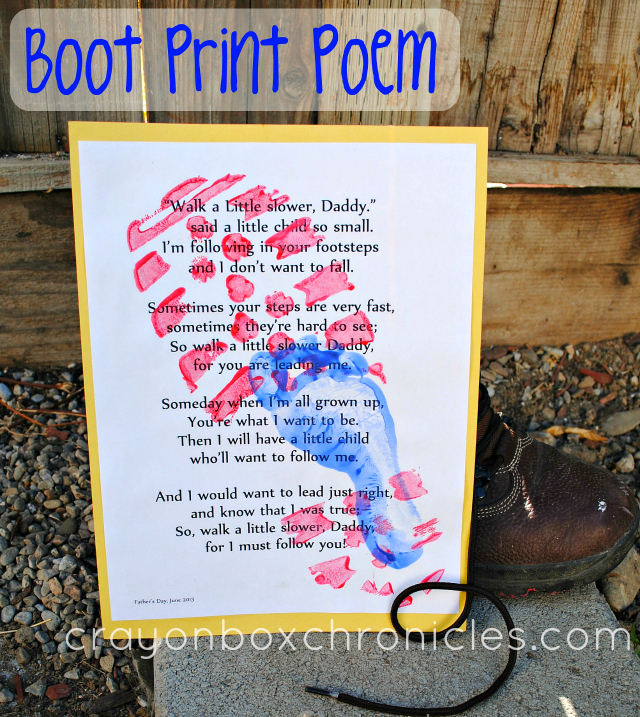 Using a large sponge brush, paint the bottom of Dads boot with a washable paint and press onto the poem. Tips: Lighter colors work well, as you’re covering the majority of the poem. Also, a construction boot with minimal paint works best — tread is higher so it’s easier to see the poem. Next, using another color, gently press your child’s foot into the paint. Stamp over the boot print. Again, use minimal paint so it doesn’t get all globby. Do you have a little sensory seeker? Here’s our top therapeutic and sensory toys we use in our OT room! 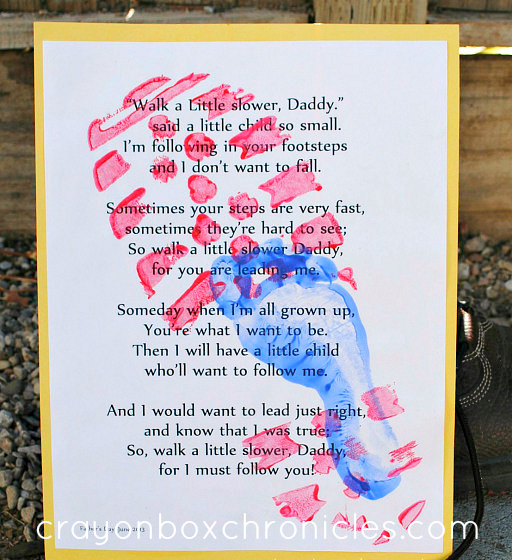 Pingback: 25 Must Make Handprint Crafts for Father's Day!